UPDATE: BILLY Slater will play for the Melbourne Storm in this week's NRL grand final after a tense wait before an NRL judiciary hearing. The star fullback faced missing his last ever NRL game after a highly debated tackle on Sharks player Sosaia Feki in last week's grand final qualifier. The NRL judiciary panel found him not guilty of a shoulder tackle, allowing him to play in the big game. He announced his retirement from the NRL earlier this year and is now on his way to a fairy tale finish with the Melbourne Storm as they play for the 2018 premiership. The panel took more than hour to decide Slater's fate as footy fans waited to find out if one of the country's favourite players would make the field again. Slater's team argued initial contact was with his pec, and not his shoulder. "It could not be said that player Slater was careless for not getting his left arm in any other position," lawyer Nick Ghabar said. "Could anything different be done? You will find this situation was handled in the safest possible manner maintaining a duty of care to himself, player Feki and his team. "What else could he have done?" 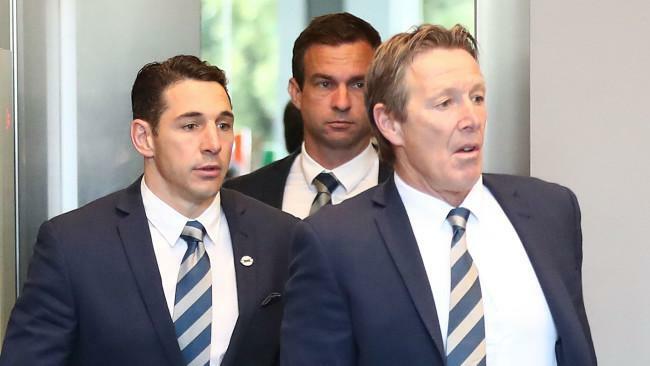 EARLIER: SUPER coach Craig Bellamy is at tonight's blockbuster judiciary hearing that will determine if his champion fullback Billy Slater will play in the grand final. It might seem a trivial matter for the coach to accompany his player to a hearing because other club coaches do the same thing all the time. But this will be the first time in 16 years Bellamy has attended a judiciary hearing. "He's coming to support Billy," said Storm's football general manager Frank Ponessi. "He just wants to be there for him. They've been through so much together he just thinks it's the right thing to do." Slater and Bellamy will return straight home to Melbourne after the hearing on the last flight out of Sydney. Slater will need a 'not guilty' verdict at the NRL judiciary if he is to play in Sunday's NRL grand final for Melbourne. The retiring Slater risks spending what would be his last game on the sideline, after he was sanctioned with a grade-one charge by the match review committee on Saturday for the hit on Cronulla's Sosaia Feki. The NRL will be represented by Anthony Lo Surdo, who coincidentally successfully prosecuted Canberra's Sia Soliola last year for his high shot on on Slater which resulted in a five-week suspension. Gun defence counsel Nick Ghabar has been brought in by the Storm to help free the retiring star to play in his farewell grand final. The 2018 NRL grand final could see Billy Slater hand over the baton as the games' premier fullback to Roosters custodian James Tedesco. But the Sydney and NSW fullback hopes the pair can play against each other one last time as Slater goes to the judiciary later tonight. Slater's illustrious NRL career may already be over as he awaits his fate, fronting the judiciary to fight a shoulder charge citation. The Storm will argue his try-saving effort on Sosaia Feki couldn't be avoided and wasn't a traditional shoulder charge as he attempts to be cleared to play in Sunday's grand final against the Roosters. JAHROME Hughes has declared he is ready to fill the fullback role should Billy Slater's hopes of a fairytale finish are dashed. Hughes is the man on standby to take Slater's place should the Slater be suspended at the judiciary. The 23-year-old has played just 17 top grade games after making his debut for the Titans in 2013. He has featured in 11 this year but just six at fullback.